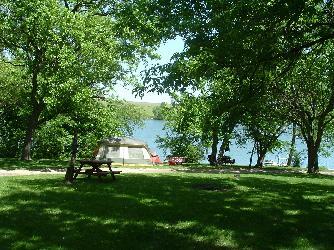 Seasonal Site: Includes Electric & Water, Grass Cutting, Boat Storage and Winter Camper Storage. 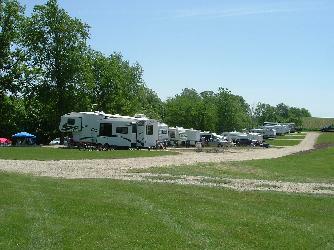 Campers must be 21 years of age or older to reserve a campsite, and at least one member of the camping group occupying a campsite must be 21 years of age or older. All rates are based on 1 camping unit per site and 4 adults (no children) or 2 adults and their dependent children or grandchildren (up to 21 years of age) per site. 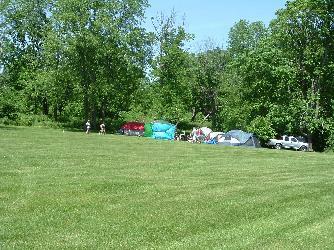 There will be extra charges for additional camping units onsite except for a dependent children's tent. No more than 2 vehicles are allowed per site. Early check-ins before 12:00pm are charged an additional $10.00. 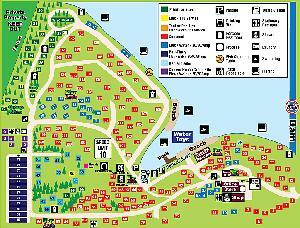 Check-outs after 12:00pm are charged a standard day pass rate for each member of the camping party. Day guests of registered campers are charged an additional $8.00 per day per adult (13 and over), $5.00 per day per child (3 - 12 years old), children 2 and under are free. All day guests must leave by 11:00pm. Additional overnight campers will be allowed on a registered camper's site (space permitting) for an extra charge of $8.00 per adult per night and $5.00 per child per night. A one night's deposit per site is required when making a reservation. Holiday reservations require a 3 day minimum stay. Holiday reservations must be FULLY PAID at the time of reservation. Refunds, minus a $10.00 service charge per site are given if reservations are cancelled at least 14 days prior to arrival (30 days prior for holidays). We are sorry, but no refunds will be given if reservations are cancelled less than 14 days prior to arrival (30 days prior for holidays).